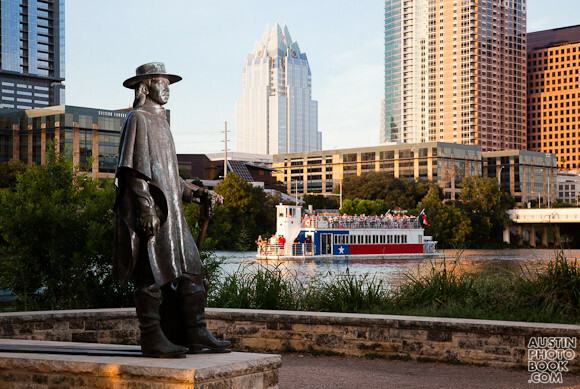 Just a few years after his untimely death, Ralph Roehming’s iconic statue of guitar legend Stevie Ray Vaughan went up on Austin’s Auditorium Shores to honor his life and music. Today, thousands of people pass this memorial to Stevie Ray each day as they enjoy the hike and bike trail, stop to take a picture, or occasionally leave flowers in his hand. We’re proud to have this image on the cover of the upcoming coffee table photo book, Austin, Texas: A Photographic Portrait. We felt that this image represents Austin as the live Music Capital of the world, and a progressive city that’s a great place to live. To capture such an important photo for the book, I visited this statue many times to get the shot, setting up studio lights to the right of Stevie Ray at sunset and waiting for the Lonestar Riverboat to pass by before clicking the shutter at the critical moment. For Strobist fans out there, the photo lighting setup was one Canon 580EX II Speedlite flash set at full power to the right of the Stevie Ray, set so that the light from the strobe matched the ambient golden sunlight. As a reminder, the book Austin, Texas: A Photographic Portrait comes out in March 2011 and will be sold both in a bookstore near you and online. Everyone loves Austin, and I want to show our city off to the entire world. I’m currently working hard on a 127 page coffee table photo book a scheduled to be published in Spring 2011. The book will cover both famous landmarks around town and hidden gems as well. As a long time Austin resident, I’m trying to capture the true essence of the city in my photos. I’ll be making posts about the book leading up to the release, and I might even be getting feedback from you to help me make the book even better. What are the details on the book? Will cover roughly 100 landmarks / attractions and will contain approx. 150+ photos. How did I get picked to shoot this cool project? I’ve been shooting and posting images of Austin for many years. A while back, I was approached by Twin Lights Publishers to photograph their upcoming Austin project which will be entitled Austin, Texas: A Photographic Portrait. Getting paid to do something I already love? I gladly accepted their offer. Well, that’s about it! If you have a must see attraction in town that you think I should capture, please leave me a comment!